I remember I used to watch Monty Python (what a hoot!) They had this series of skits called…and now for something completely different! 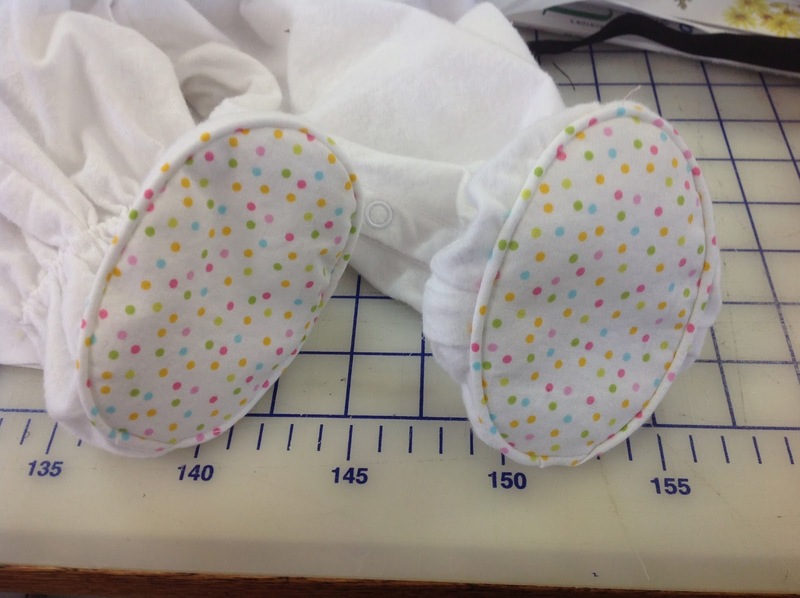 So to steal a line from British comedy, this latest post is not about bra-making at all, but a fun little project I did last week. 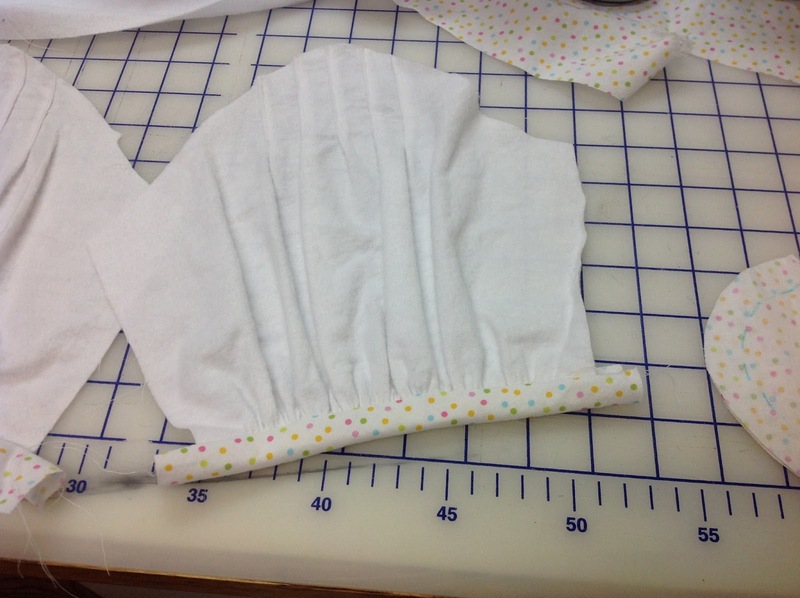 So I thought about what to make for the new baby…several things came to mind and then I got started. I certainly can’t make a bra for her (yet) but the thought came to my mind…And now for something completely different! I would do something I did when I was an educator for Sulky Threads – smocking! 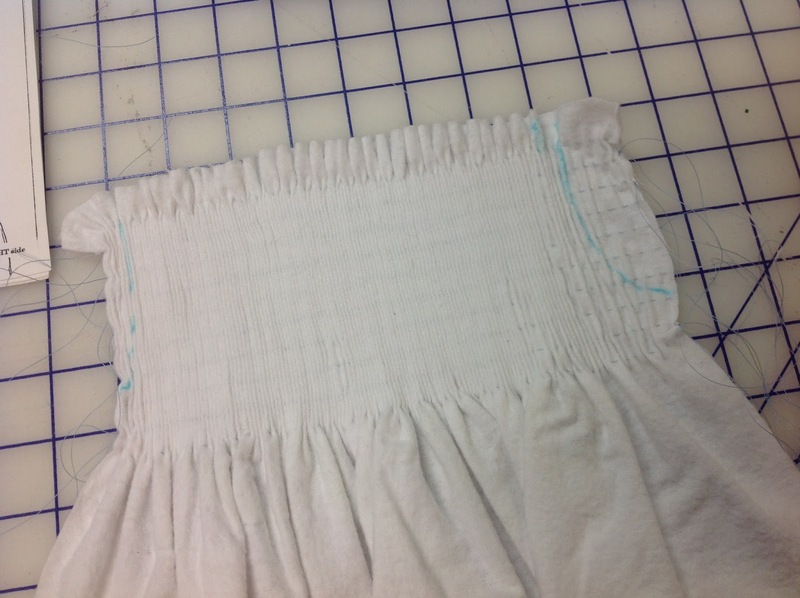 More specifically – smocking by machine instead of by hand. First I used a pleater to gather the flannelette into small evenly spaced pleats. This one is from Australia and is one of my prized possessions! The I put stabilizer on the back and stitched across the pleats with decorative stitches. I drew inspiration from the colourful trim fabric you can see at upper left. 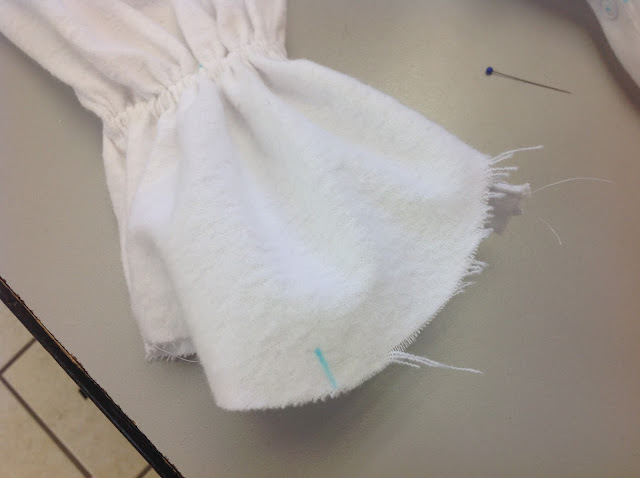 And sewed the sleeves into the armhole and then of course, the side seams and the collar. Gosh, I love the collar trimmed with that tiny piping! I’ll admit, my heart was in my throat as I hammered in the snaps on the front and the inseam. 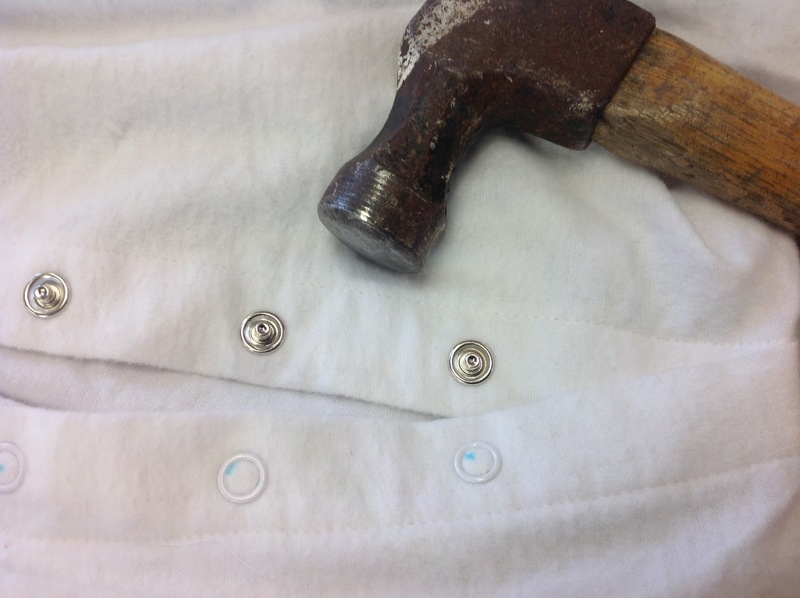 I mean, I do corset grommets all the time, but this was something completely different! But to my great relief, they went in just fine! The foot was trimmed in the same tiny piping as the collar. I also hand sewed a flannel lining inside the foot so there are no raw edges to bother her feet. Look at those wee feet! Welcome to the world Elliott Harper Higgins (9 pounds 7 oz) born April 1, 2016! Congratulations to proud grandparents Denise and John! My question to Denise is – when do her sewing lessons start? 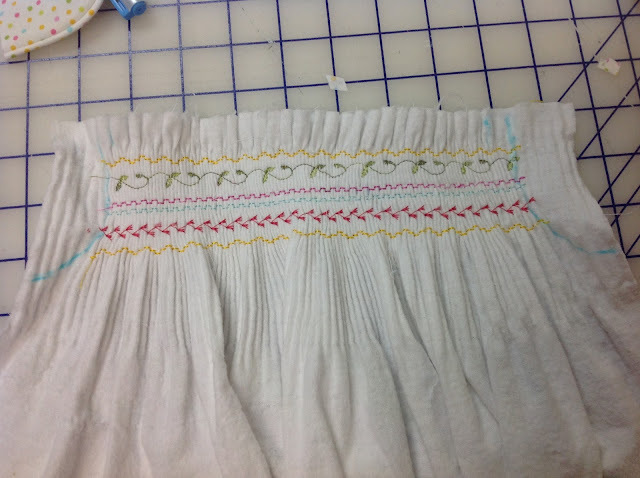 Smocking is quite lovely and I used to teach both hand and machine smocking a long time ago (before I became the Fairy Bra Mother!) I love the look and it is something we don't see a lot these days! It is so cute! I'm always so sad that I never asked my mother to teach me the art of smocking. She did it all by hand. 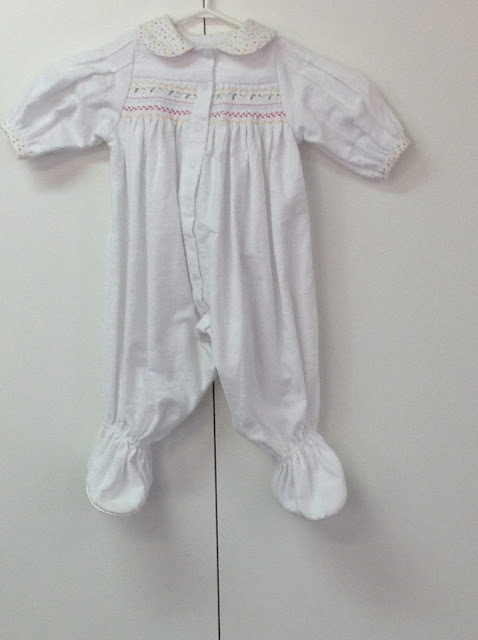 I even had a doll's dress which was smocked. I truly enjoyed doing this although someone mentioned I could have made a sleep sack…never even heard of that, but it is now something to think about! I will pass along the best wishes. I was definitely excited about this birth! Oh yes, so it! She will remember that forever! Congratulations to Denise on being a grandmother. Lucky granddaughter! Lovely job on the smocked pjs. So pretty. Congrats to the parents and grandparents. 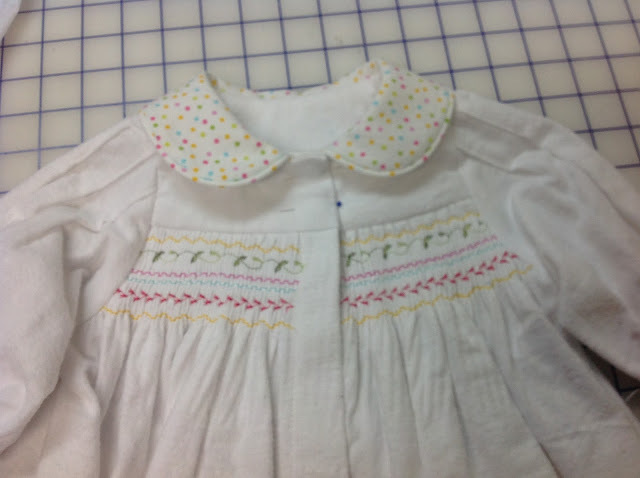 Bev the smocked outfit is so adorable and you always inspire others to expand their sewing horizons! I have stepped out of my comfort sewing zone with all your classes. Once again congrats to all!!! Turned out beautifully, great job! Congratulations to Denise and John, life as you know it will never be the same. Beautiful! I was so disappointed that my daughter didn't want smocked things for her own daughter–but you've inspired me. I'll make her pjs! Congratulations Denise & John! Grandchildren are God's blessings! 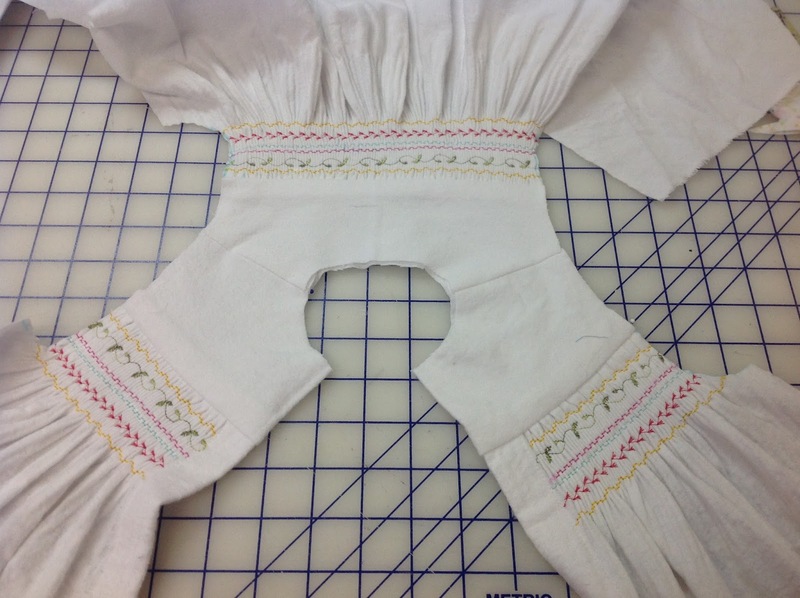 I love this smocking but Beverly, I'm with you – the sleeves should be gathered!